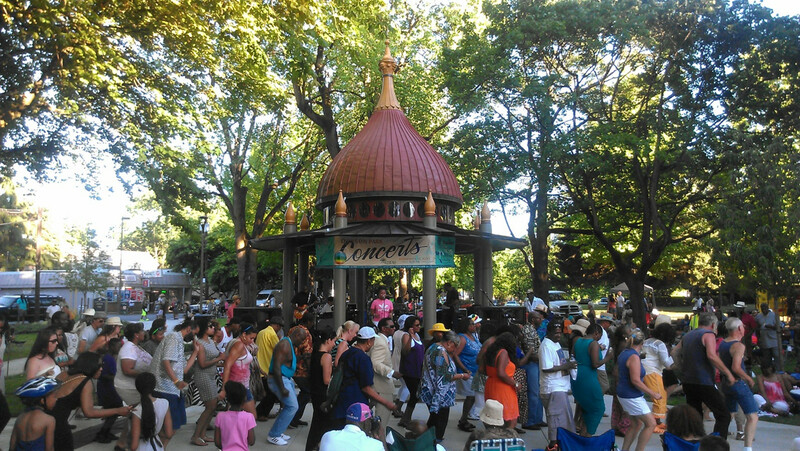 A musical tradition over 110 years in the making, Concerts in the Park offers something for everyone. 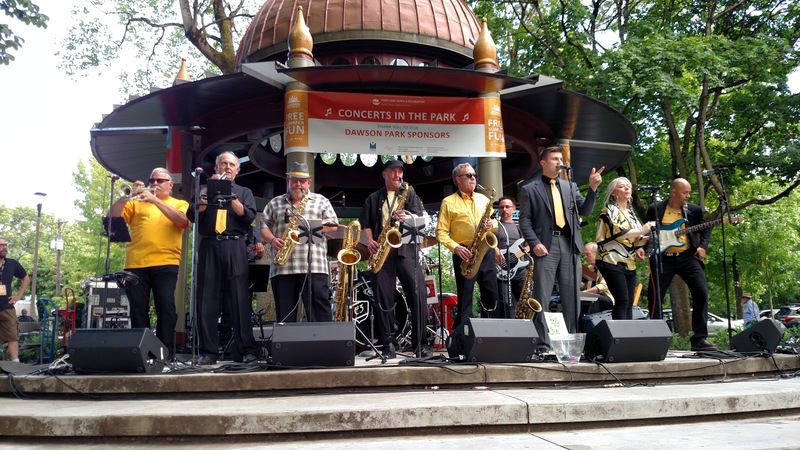 The Rose City’s best and brightest – from classical to country, rock & roll to rhythm & blues – have been entrancing audiences in parks since 1901. Today’s crowds flock to Portland parks citywide for the revelry, with over forty thousand people attending 61 concerts offered in 2016. 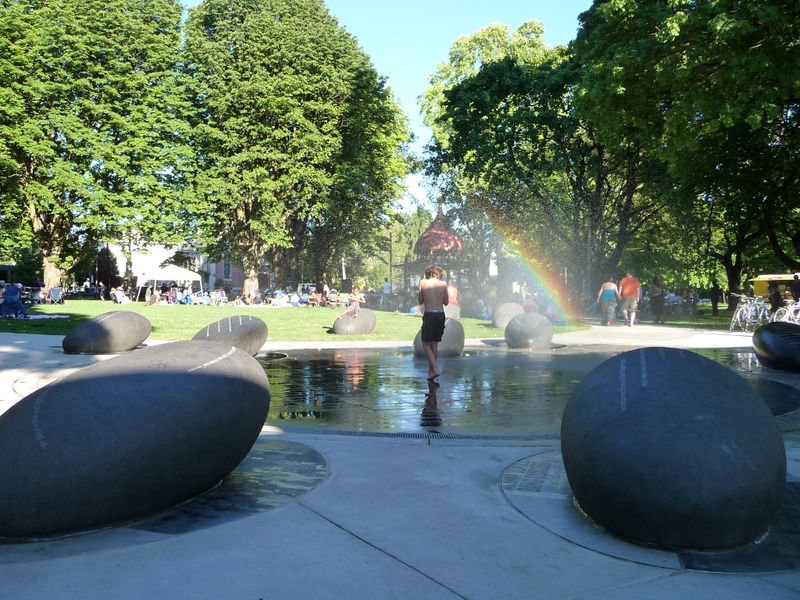 Right in the heart of Eliot, positioned a block away from the Emanuel hospital between Williams and Vancouver Avenues, lies one of Albina’s most treasured historic spaces: Dawson Park. Today, it’s a shaded, grassy expanse complete with playground, basketball courts, and public fountain. 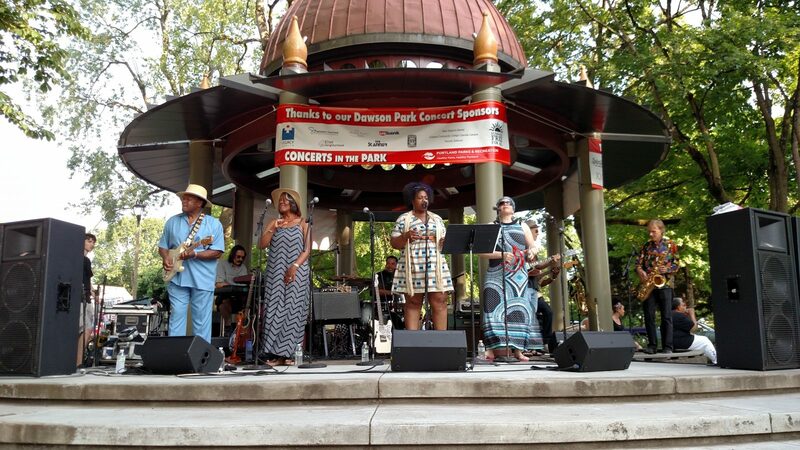 All throughout July, catch free public concerts at Dawson Park every week–but before rolling out the picnic blanket and bringing the family down, learn a little about why Dawson Park’s story is tied so closely to the history of Northeast Portland. When the summer sun shines in Portland, it’s time to get outside. 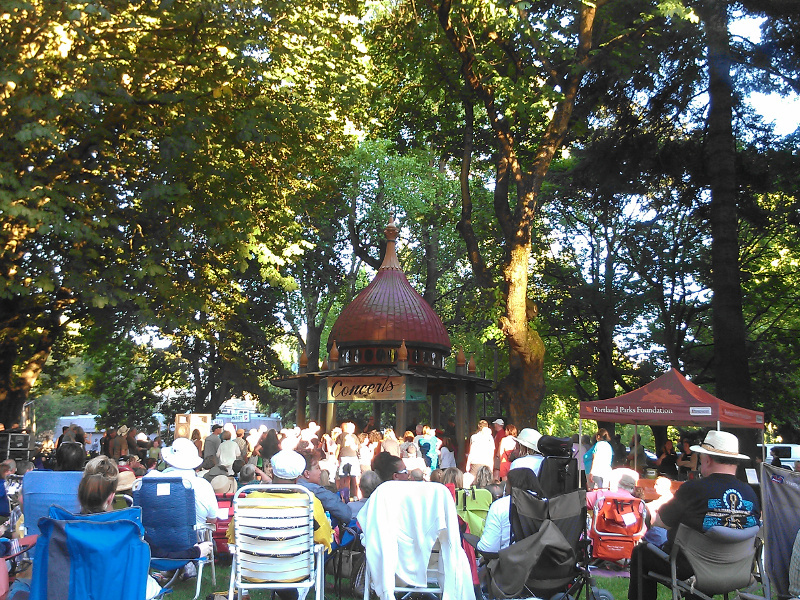 What better way to spend an evening during our beautiful Portland summers than enjoying a live concert or watching a great movie in your neighborhood Dawson Park! We are hosting 4 concerts and one movie this summer. These events are Free To The Public and are a great way to spend an evening out in the neighborhood. Concerts start at 6:30pm and the food vendors on site will be My Mamma’s Gumbo and Island Daydream Shaved Ice. During movie night, live performances by local musicians and free popcorn begin at 6:30pm and the movie starts at dusk. Hi neighbors, we need your help! If you love attending our annual “Free for All” summer concerts and movies at Dawson Park, here is your chance to help ensure these awesome events continue. 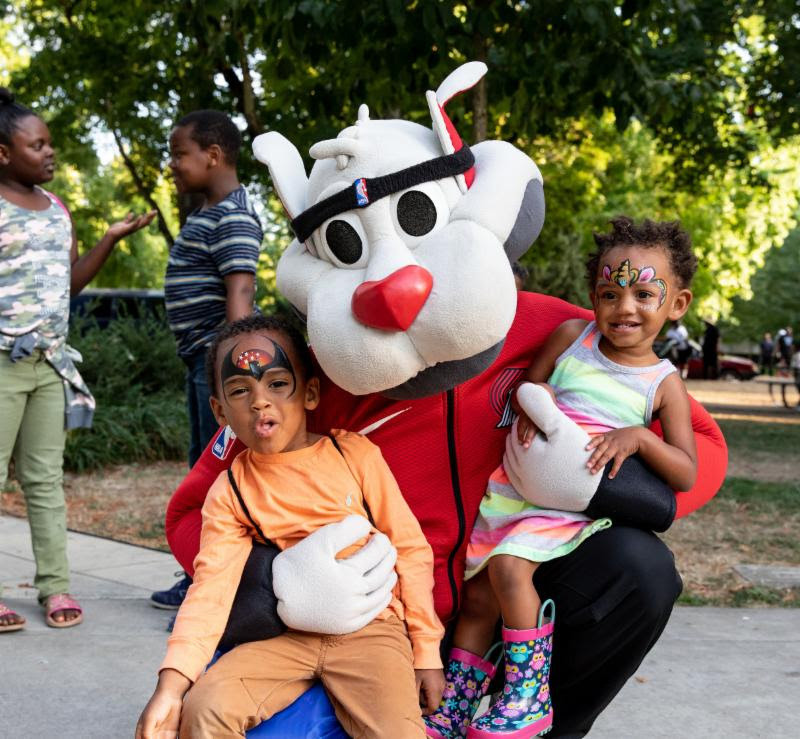 On August 4 at Dawson Park about 75 neighbors gathered for National Night Out. Dawson Park regulars, neighbors new to Eliot, members of the Neighborhood Association and some local businesses all came together to share a potluck dinner, enjoy music by Anna Paul and the Bearded Lady, and get to know our neighbors a little better. 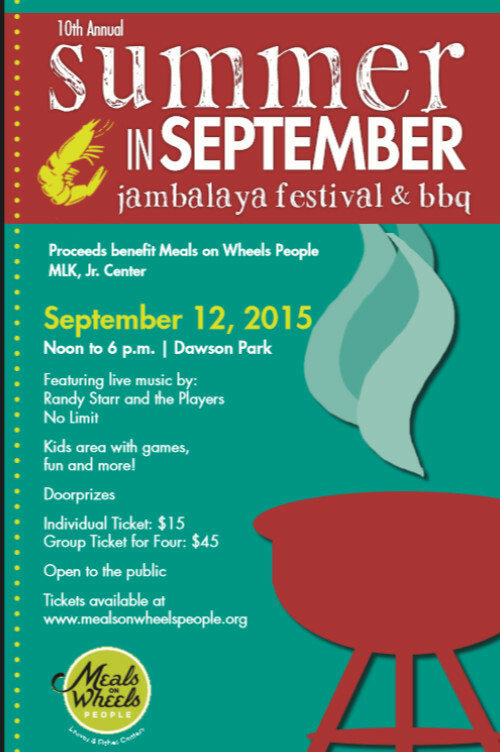 Meals on Wheels People Martin Luther King, Jr. Center will host the 10th annual Summer in September Jambalaya Festival & BBQ Saturday, Sept. 12, from noon to 6 p.m. at Dawson Park. Live musical entertainment will feature Randy Starr & The Players as well as BlowFrogz. Join Eliot Neighborhood Association for a National Night Out party in Dawson Park! This is a fun, free neighborhood event featuring live music, a potluck, a raffle, safety information, neighborhood information and more! Your Dawson Park Summer Event Committee has been hard at work this winter and spring gathering sponsors to be able to put together a fantastic lineup of concerts and a movie for you this summer. These events are free to the public but couldn’t be done without the support of our local sponsors as well as individual donations. If you’d like to donate to the Dawson Park Concert fund, it’s easy! Simply visit the Give to Concerts site, choose “Dawson Park” from the drop down menu , then click “Give Now!” to pay through PayPal and receive an immediate tax receipt. Portland Parks and Recreation is asking you to “Please pardon our dust!” as they perform some maintenance in Dawson Park this spring. Back in July Dawson Park opened for the first time after it was closed in October 2013 for a $2.7 million makeover. After 10 months of construction, on July 9th, the park was revealed to the neighborhood at a community concert featuring Karen Lovely. The renovations include modifications to the gazebo to make it more accessible and usable for concerts, a new walkway around the park, a new entry on Williams, a new water feature complete with historic interpretive boulders, a much improved playground area and more. The Dawson Park concert planned for Wednesday July 23rd has been rescheduled due to weather. Come listen to Pa’lante on Wednesday August 6th. 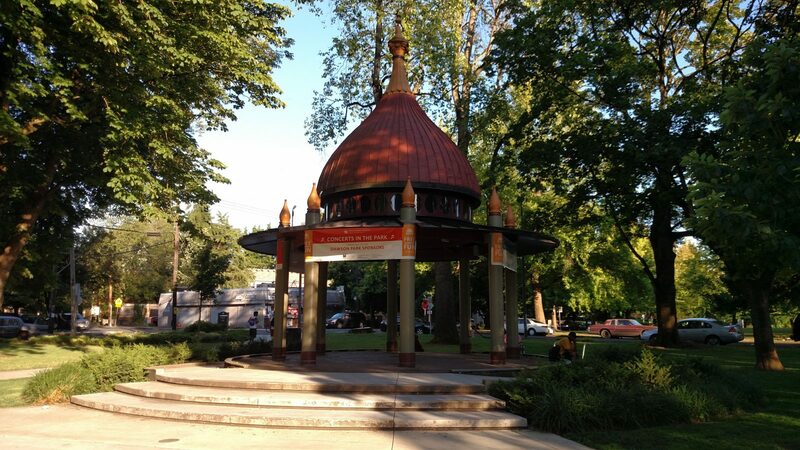 For more information on the concerts see Dawson Park Summer Events 2014.